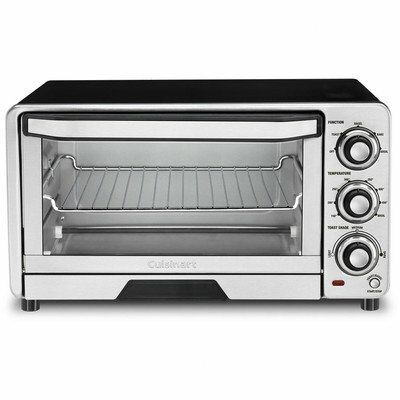 Cuisinart TOB-40 Custom Classic Toaster Oven Broiler is a 4-in-1 functioning appliance. It uses 1800 watts power to toast, bagel, broil and bake. Its full size interior can hold 4 slices of bread and an 11 inch pizza. It has stainless steel front and weighs 12.9 pounds and its dimensions are 16.29″ x 14.63″ x 8.86″. Cuisinart TOB-40 Custom Classic Toaster Oven Broiler also comes with a convenient automatic slide-out rack which helps remove the cooked food free of hands. Shade Control – The toast shade control checks the temperature and timing to provide the required shade of toast which the user has selected. Automatic Shutoff Safety Feature – One of the best features in this oven is the automatic shut off safety feature. This helps the oven to shut down if it reaches a specific temperature at which there is danger of burning. Accessories – Cuisinart TOB-40 Custom Classic Toaster Oven Broiler contains a broiling rack, a drip pan, a baking pan, a wire rack and an instruction manual which also contains some recipes for the user. It also contains a front removable crumb tray. 3 Year Warranty – The TOB-40 comes with a 3 year limited warranty, which is longer than other types. What Do Users Say About The Cuisinart TOB-40? Space Saving – Most users love this product for its small size that can fit easily in small sized kitchen counters and even a RV. Easy Cleanup – The interior is non-stick which makes it very easy for the user to clean it up. The crumb tray slides out easily for cleaning too. Fast Toasting – With 1800 watts for the total heating elements, this oven is fast in toasting, and is also very good at baking. They found it takes about 1 1/2 minutes to toast white bread and toasting is complete on both sides. No timer – Many users complain that with toast shade function and no timer, you can’t control the exact color of bread. The toast comes out either too dark or too light. Furthermore, the indicator groove on dials is black like the dial, and it’s hard to see what the dial is pointing to. Broiling – It takes a long time to broil chicken and although its capacity is normal. Inaccurate Slice Parameters – Although Amazon claims this oven to be 6 slices, the slice parameter of this oven on official Cuisinart site is 4 slices. This might be a little mistake that Amazon make. If you have a large family, you might need to consider a new model. Anyone who wants to broil chicken or turkey regularly should avoid this oven because it is slow in broiling chicken and also it would be difficult to fit these items in this oven. Without the annoying no-timer-setting, this 4 in 1 cooking option oven is a wonderful and powerful product with an 1800 watts power rating. It’s in an affordable price range and easy to operate. In my research, I found that some users said other cheaper models could have same performance with this oven. However, an extra ordinary 3 year warranty is a great thing to have with your household appliance.